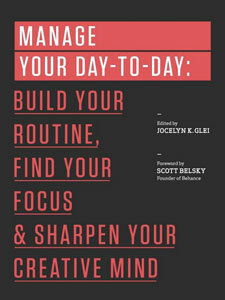 I've spent about six weeks discussing Manage Your Day-to-Day, a book of essays on working with creativity edited by Joceyln K. Glei. I got a lot out of this book for two reasons. It deals with issues I've been studying and thinking about for a year and a half as part of my Time Management Tuesday Project. Metrics and using social media mindfully certainly relate to ideas I've been writing about here. Even what are new concepts/terms for me, such as creative vs. reactive work, can be applied to what I do as a writer. I liked the short essay format. I've read a number of nonfiction books this last half year on subjects connected in some way to managing time or writing. Many of them were bloated with narrative sections that went on far too long or didn't seem to illustrate the point being made. 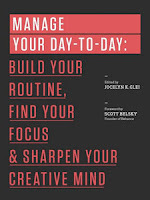 The essay format used in Manage Your Day-to-Day eliminates that. The writers stick to one specific idea in each essay and don't meander. Yes, some essays were better than others, either because the material was of greater interest to me or I felt the writing was better. But that's the beauty of a book of essays. You can pick and choose, not read everything, and still get complete reading experiences because essays are complete narratives. I purchased this book as an eBook for Kindle, so it was incredibly affordable. This is an example of eBooks providing opportunities for discovering new writers and concepts because of their lower cost. Thanks for the article. Imho, calendars and to-do-lists are tedious and unintuitive for most people to use. Over 2B people use email but a tiny fraction use calendars and to-do-lists. Lot of things we need to get done come through email and get buried under other email - e.g. a meeting request, spouse's reminder. Or they may pop in our heads at a random times. It is not convenient to pull out a calendar or to-do-list to put it on there. Just the # of clicks it takes to enter an appointment is arduous. It is much more natural to "tell" it to someone to get reminded about it - e.g. text it, send an email. Probably, why busy (and rich) people hire personal assistants. "It makes calendars, to-do-lists and time management as simple as sending an email or a text message to your free personal assistant." And the personal assistant then creates the calendar or to-do list? So we're still talking a calendar or to-do list?